You can more clearly visualize how power flows through the drive train by following the flow of power through it. Figure A shows all the components as they are located on a vehicle with rear-wheel drive. 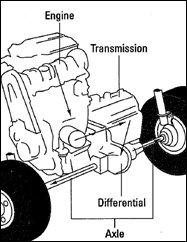 If your vehicle has front-wheel drive, Figure B shows you the way the power flows through a transaxle. 1. The running engine produces power that causes the crankshaft to turn at a particular rate of speed. The faster the engine runs, the more power it produces and the faster the crankshaft turns. 2. At the rear end of the crankshaft is the engine flywheel. This disk shaped plate turns at the same rate, and in the same direction, as the crankshaft. 3. Facing the flywheel is the first part of the clutch. This disk-shaped plate is called a clutch disk. When you are not stepping on the clutch pedal, this disk is forced against the flywheel (see Step 4). A coating of friction ; material causes the two plates to adhere to each other, which forces them to turn at the same speed. · When you step on the clutch pedal to disengage the clutch and dis­connect the engine from the transmission, a clutch release arm forces a throw out bearing into the pressure plate’s release levers. As a result, the pressure on the clutch disk is released, and the disk can turn independently of the flywheel. · After you move the gearshift to the proper gear, you release the clutch pedal. This movement causes springs in the pressure plate to force the disk against the flywheel again, and both the disk and the flywheel resume spinning together at a new speed. 5. In this way, the clutch disk can catch up with an engine that is turning faster or more slowly than before and can transmit its motion to the transmission. On the clutch side of the flywheel, the drive train continues, but its name changes. It is not called the crankshaft anymore; it is now called the transmission input shaft because it carries the power via the turning shaft into the transmission. It rotates at the same speed and in the same direction as all the parts I’ve covered up to now. 6. Inside the transmission is a group of gears of varying sizes. These gears can move together and apart, in various combinations, to determine how fast and with how much power the car’s wheels will turn, and in which direction. 7. The next part of the drive train emerges from the other side of the trans­mission, with another new name. This time it is called the transmission output shaft because it transmits the power that the transmission is putting out to the driveshaft. 8. The driveshaft of a rear-wheel-drive vehicle with a conventional engine has a U-joint (short for universal joint) at either end. The V-joints enable the driveshaft to move freely without affecting the more rigid transmis­sion shaft at one end, and to absorb the vertical movement of the rear axle and wheels at its other end. · On cars with transverse engines, you can find the V-joints where each axle joins the transaxle and where each connects with the car’s drive wheels. Called constant velocity (CV) joints, they can, like other V-joints, turn and move in any direction up, down, and from side to side. 9. The differential is another box of gears that takes the movement of the spinning drives haft through a 90-degree angle to the axle that turns the drive wheels. It also allows each side of the axle to rotate at a different speed. This ability is necessary because, when you . go around a sharp curve, the outside wheel travels farther than the inside wheel and has to move more quickly than the inside wheel, just like the ice skater at the end of a snap-the-whip line. The differential also provides the drive wheels with extra power by using its gears-to convert every three revolutions of the drives haft into one revolution of the drive wheels, which is called a 3 : 1 gear ratio. On front-wheel-drive cars, the differential is located inside the transmission; that’s why it’s called a trans axle assembly.